If you loved my Mini Crustless Quiches, you'll love this because it's based on that one. But unlike the quiches, the omelette takes literally minutes to prepare, if you already have the filling made. Fill it with whatever tickles your fancy (for dinner try vegan pepperoni, pizza sauce and soy cheese). Pour batter into the center of a large non stick skillet (medium high). Use a spatula to smooth over the top. Place your filling over the batter and reduce heat to low. Cover and cook until edges have dried out, lift a small section to see if it's set. When it has, loosen the omelette by sliding the spatula under it from each direction and then fold one side over the other. Cook for about one more minute. Slide it onto a plate. 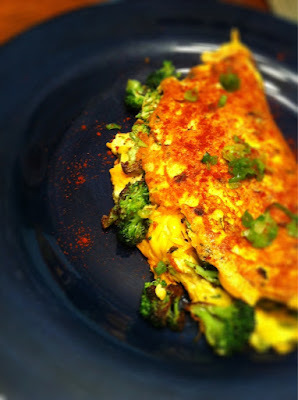 I wanted to include veggies in my breakfast, so I filled my omelette with broccoli that sautéed beforehand. I included chopped green onions in the batter after I blended it and used green onions as a garnish. I also topped my omelette with a little of the Chipotle Remoulade left over from my Not-So-Krabby Patties.